Adventure is the first real graphical roleplaying game I remember playing. It allowed you to have a stash of items, which you had to select one to use at any given moment. You could drop and pick up items without using a text command. And it even managed a ‘fog of war’ effect where much of the catacombs you explored were obscured except what was immediately around you. So what if the maps were mirror images (thanks to the limited processing power of the 2600). To my eight-year-old mind, it was like playing D&D on the computer screen. This was also my first true experience with story in a video game. Granted, many arcade games of that time had stories, but Adventure was a game I could play over and over again without burning quarters and on my own time. 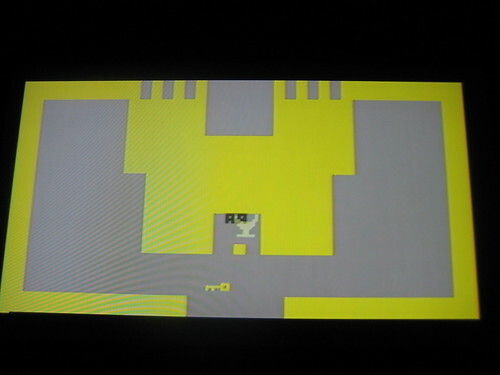 Plus, the game’s rudimentary use of the game reset switch after you ‘died’ put you back in the gold castle; any objects you had on your person remained where you met your demise. The story was a quest: find the enchanted chalice and return it to the gold castle. 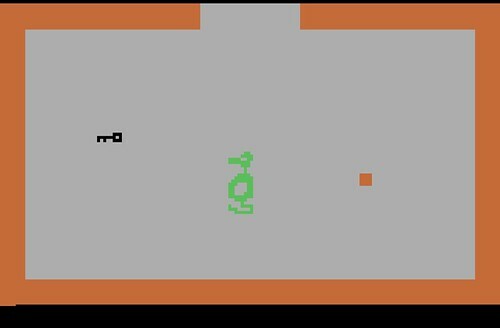 You had to search a myriad of castles, mazes, and other rooms within Adventure‘s world to find the sword, keys, bridge, and magnet you needed in order to succeed in the quest. Oh, and you had to kill three dragons (in the easy version, only two). Some of my absolute favorite video games – and a feature that weighs heavily in my purchasing and play decisions – are ones with good replayability. I’d like to think Adventure was the genesis of this trait. So: visual, story, replayability. Three basic and important pillars of how I personally judge video games, and I can trace all three back to Atari’s Adventure console game. It’s not the first video game I ever played, but it certainly is one of the most influential. When my Mom took me to Sears in 1979, I wandered away and played the display game until she found me. I did that every time she brought me. She never learned.